may have eternal life in him. Someone told me after a homily –don’t push forgiveness too much. It’s very hard to forgive. We sometimes meet examples of forgiveness in our lives, and people we know near and dear to us who have let things go – especially in the family. Jesus himself was the example of forgiveness on the cross. It is a tough call to forgive big injustices, and we often can’t. The Cross is exalted as the sign of Jesus’ forgiveness of the world. A big challenge in ours in both the ordinary, everyday hurts and bitternesses, as well as the big ones. What helps me to forgive – gratitude in my own life. Grateful people can forgive more easily. Daily prayer always includes prayer of thanks. Otherwise the other side of life takes over. And if God has forgiven me, I will want to give to someone else the liberation I have received, especially if that person has hurt me. Our daily prayer may also include forgiving the harms and hurts of the day. The biggest challenge of Christianity is to forgive – people, nations, all sorts. The church is called to be the community of the forgiving and forgiven. There’s a good phrase used sometimes – ‘ God forgive them’. True! When we cannot forgive of ourselves we can say the words of Jesus – God forgive them. A good prayer and a prayer for all times and all ages. It can be the beginning of freedom and forgiveness; and entering into the grace of Jesus Christ who on the cross is the forgiveness of our sins. This is why we ‘exalt’ the cross –receiving in joy the forgiveness of God and knowing God as total forgiveness. 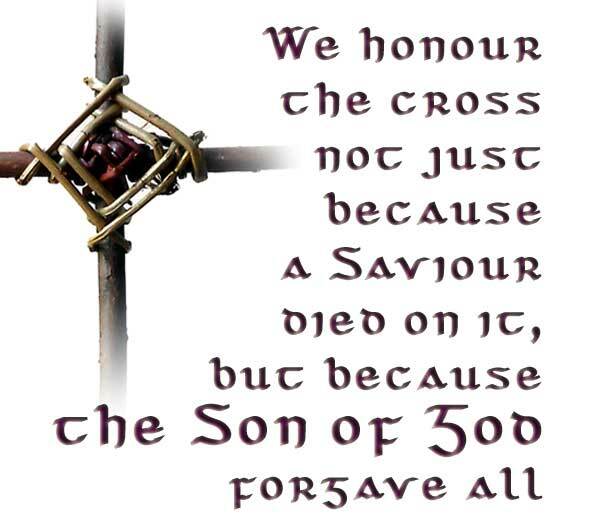 We honour the cross not just because a Saviour died on it, but because the Son of God forgave all. This entry was posted in Gospel of John, Gospel Reflection, Liturgy Resources, Prayer Resources, Scripture and tagged community, Donal Neary SJ, Feast of the Exaltation of the Holy Cross, Forgiveness, freedom of forgiveness, Gospel Reflection, gratitude, His only Son, Jesus, Jesus Christ, John 3:13-17, Prayer, Reconciliation, salvation, saviour of the world, Son of Man, Sunday Gospel reading and Reflection for the 14th September 2014, Sunday Scripture and Reflection for the 24th Sunday Ordinary Time Year A.